“The only things I had to begin with in The Man from U.N.C.L.E. 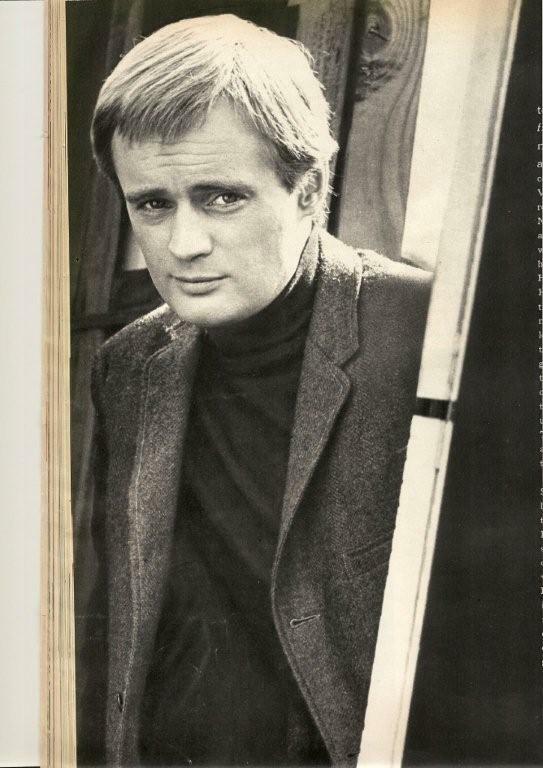 were the name Illya and a Russian accent,” says David McCallum, costar of the NBC-TV Robert Vaughn spy series. “I created the rest of the characterization myself. No one knows anything much about him, actually. You don't know where he lives, what he eats, whom he knows or where he comes from. He's an exotic, romantic character. He's strange – that's the secret of the romantic element, I think; the more you know about someone, the less excitement you feel in relation to the person. It's like meeting a girl. You take her out to dinner, and the more you know her, the less excitement there is, physically. Eventually, it's all dissipated unless some underlying real feeling is there. There's something very romantic about a spy nobody knows anything about. “U.N.C.L.E. is a lot of fun to do. Since they can't find anyone who looks like me – all the stunt men they turn up look like Edward G. Robinson – I've been doing my own stunts on the show. I like doing my own, but if I break a leg, then it would be a bit foolish.” As Illya, David is menaced by annihilation in all sorts of curious ways – entrapment by a loony scientist, attacked by dogs conditioned to kill by remote control, pursuit by a villainous organization of females. “My wife, Jill Ireland, also is an actress, and she's played my girl friend on U.N.C.L.E. a couple of times. We met in a movie we did together in England, before we came to the United States. I originally came to Hollywood more than three years ago to play Judas in The Greatest Story Ever Told. After doing that for nine months on location in the desert, I sat and worried for almost a year. Nobody seemed to know I was here, and I almost panicked before finding work in TV shows like Outer Limits and Profiles in Courage. “I was the soldier who invented the pants to hide the sand while digging the tunnel in The Great Escape, and in my next, M-G-M's Around the World Under the Sea with Lloyd Bridges and Shirley Eaton, I'm an electronics engineer who goes to the bottom of the sea. Most of the things I've done professionally have been things that I have had fun doing. It would be rather miserable otherwise. “My mother's family were all musicians, my father was concertmaster for several orchestras including the Royal Philharmonic and the London Philharmonic. Then he began free-lancing around, doing recording sessions. I played the oboe when I was small and my father wanted me to stay in music, but I gave that up to be a complete ham by going on the boards. I was property master at an opera festival, then went to the Royal Academy of Dramatic Art and spent some time in the army. When I got out, I worked in TV, stage, and films. “I'm just like my father, very restless. I can't sit still. I like to keep my hands busy. I was a child who fiddled about with clocks, and I entered the world of the theater working with my hands. After the war when there were quite a few actors about, it was difficult getting into stock companies so I concentrated on the technical end of things. Now I read about myself as an overnight personality, whatever that might mean; it's taken me fifteen years of nights to make the grade. We've made twenty-nine U.N.C.L.E. shows here at M-G-M—TV so far, and I've succeeded in making an impact through the show, which is very gratifying. I've been getting all sorts of registered parcels at the post office from fans. Most of them are returned unopened, but when you do open them, you find they contain Girl Scout cookies wrapped in tissue paper, things like that. I haven't the heart to send them back. Seventeen magazine, September 1965, pgs. 116-117.